Having established strong positions on the markets of discrete graphics cards and mini PC barebones, ZOTAC is marching into factory-built systems targeting gamers and professionals. On the gaming side of the spectrum, ZOTAC is expanding the range of its MEK computers. On the workstation side of the things, the company is getting ready to launch a new NVIDIA Quadro-powered workstation for enterprises. 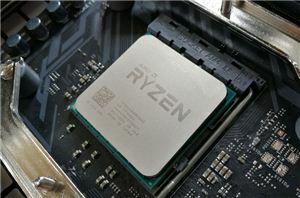 At Computex, the company demonstrated its fourth product aimed at creative professionals and featuring two 10 GbE ports. 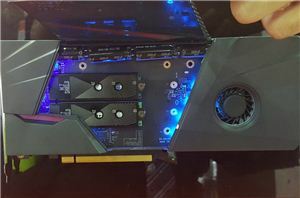 ZOTAC showcased its first workstations with NVIDIA Quadro P-series graphics cards at CES in January 2018. The systems featured custom-built chassis with ZOTAC’s signature backlit on/off button and the brand logotype. 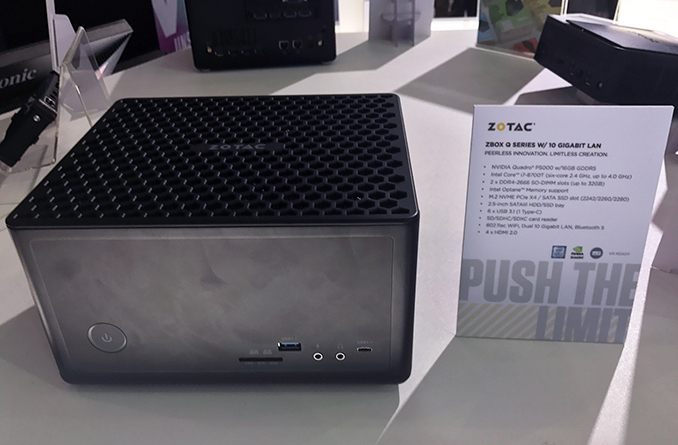 For the actual products that are listed on its website, ZOTAC does not use the large enclosure demonstrated earlier this year but sticks to more compact designs. 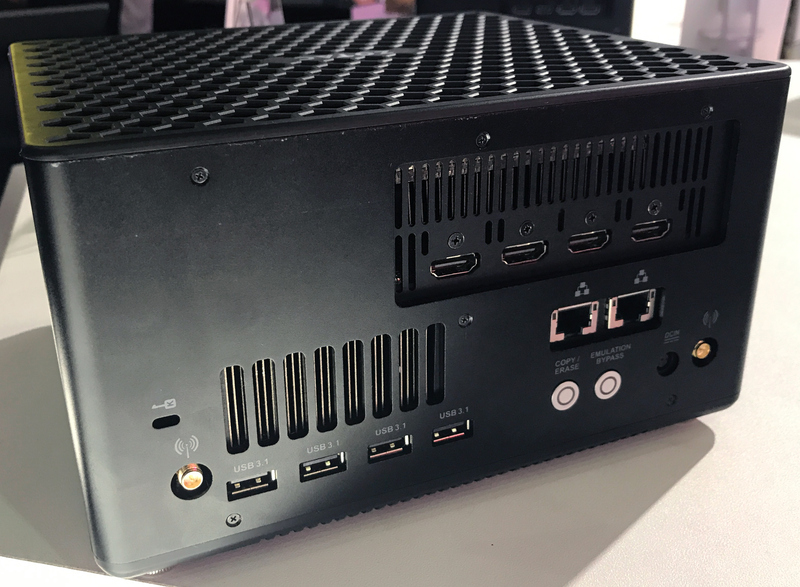 Meanwhile at Computex, the company introduced its new Zbox Q-series machine that comes in ZOTAC’s traditional chassis used for high-end Zbox Magnus PCs/barebones. ZOTAC’s upcoming Zbox Q-series workstation will be based on Intel’s Core i7-8700T (six cores, 2.4 – 4 GHz) processor accompanied by NVIDIA’s Quadro P5000 professional graphics accelerator with 16 GB of GDDR5 memory. Just like contemporary Zbox Magnus desktops, the Zbox Q-series supports up 32 GB of DDR4 memory, an M.2 PCIe 3.0 x4 NVMe SSD, a 2.5-inch SSD/HDD as well as regular connectivity technologies: 802.11ac Wi-Fi, Bluetooth, USB 3.0 Type-A/Type-C and so on. Meanwhile, the key feature of the product is two 10 GbE ports enabled by chips from Intel, likely from an X550-AT2 controller. Two 10 GbE NICs are usually required by enterprise customers that also demand network controllers from Intel. In fact, the Zbox Q-series machine demonstrated at Computex looks like a system built with a particular client in mind. 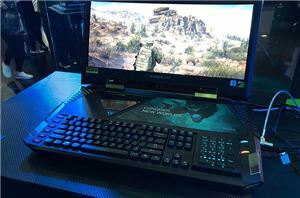 For example, it uses a custom version of NVIDIA’s Quadro P5000 with four HDMI outputs (it is possible that an MXM module with a riser card is used). By contrast, NVIDIA’s reference Quadro P5000 card is long, it has three HDMI connectors, one DisplayPort, and one DVI-D output. In addition, the PC has Copy/Erase and Emulation Bypass buttons on the back. 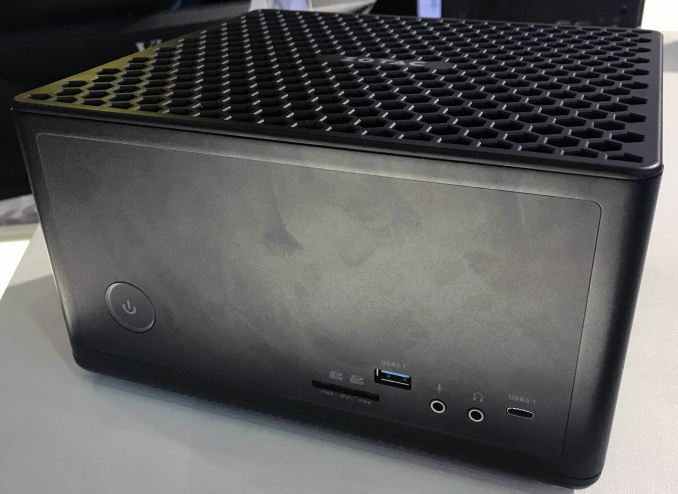 Since ZOTAC has demonstrated the new Zbox Q-series system at Computex, we have all reasons to expect it to hit the market at some point later this year (the maker says Q4). 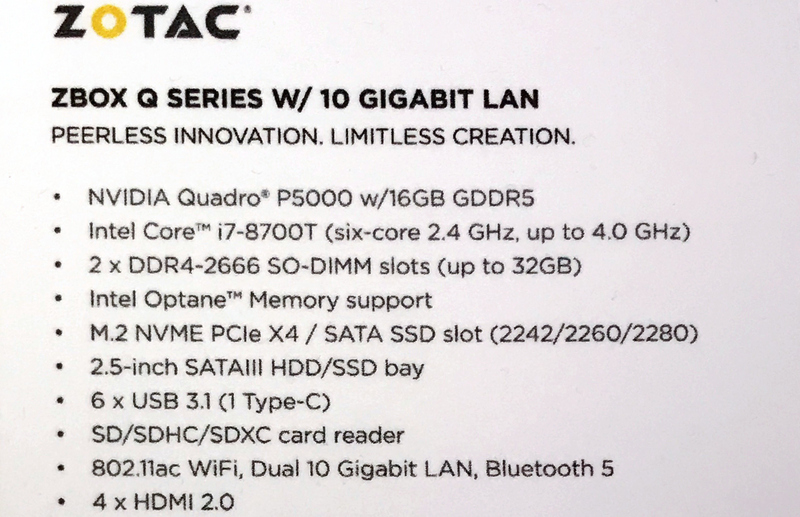 Whether or not it will be available widely is an entirely different question, but one thing that this unit shows for sure is that ZOTAC is expanding its workstation range rather rapidly. Yeah that was my first though too. Uh. None of the new-ish Quadro cards have HDMI on them. Smaller/lowprofile P630/whatever stuff is miniDisplayPort.